Ringing cell phones can be an interrupting bother, and sometimes I yearn for the days when phones resided in buildings or on street corners, not in your pocket. However, last Tuesday, while at the Dupont Environmental Education Center (DEEC) in Wilmington for a meeting, I was very thankful for the new phone technology. 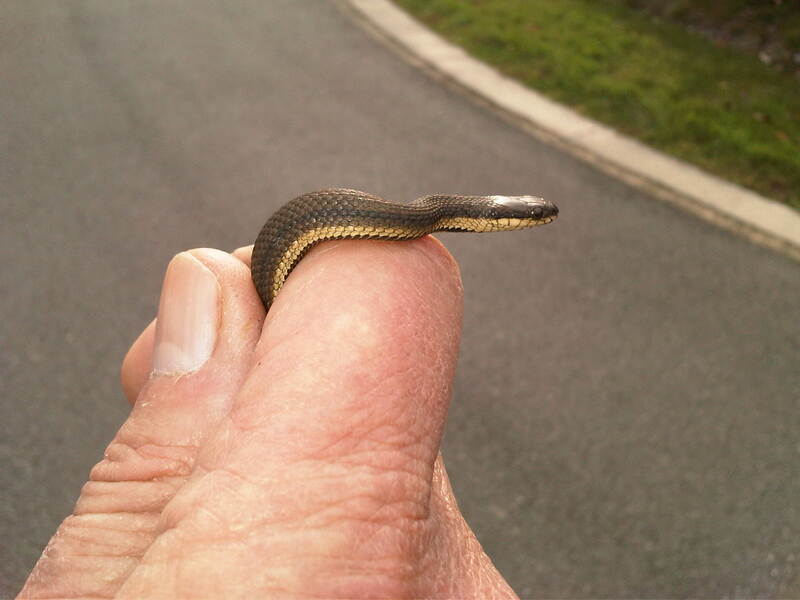 While also at DEEC that morning, past DNS board member Greg Inskip observed a snake that he was not familiar with, and immediately took several photographs of the snake on his cell phone. Greg then showed the photos to Joe Sebastiani who immediately called me (cell phone to cell phone), reporting that he thought he was looking at a photo of a Queen Snake (Regina septemvittata), a snake rarely observed on Delmarva. Within minutes I was able to see the snake photographs myself, and concur with Joe’s identification. It was indeed a Queen Snake – the first to be found at or near the Russ Peterson Urban Wildlife Refuge where DEEC is located, making it a very exciting find. The Queen Snake typically is found in relatively high quality freshwater marshes or streams. It also seems to live only in areas that have healthy populations of crayfish, on which it feeds. The marshes at the Peterson Refuge have undergone extensive restoration over the last 15 years by the Delaware Department of Fish and Wildlife. This restoration has greatly increased the overall health of the refuge’s marsh ecosystem, which probably explains why we are finally seeing the Queen Snake inhabiting the refuge. This relatively small to medium-sized snake rarely grows longer than 42 inches. It is the most aquatic snake in our area and spends much of its time searching underwater for crayfish that have recently shed their exoskeleton and become “soft-shelled”. Its “eel-like” slender brown body, with yellowish lateral stripes running from the nose to tail, is perfect for slipping into crayfish burrows and under debris. This snake rarely bites when handled, but like many snakes, it will emit a strong musky-smelling fluid. So while cell phones may be a pain at times, I encourage you to use them to photograph any amphibian or reptile that you find and to call me or send me a text message to report your find (302-593-9622). 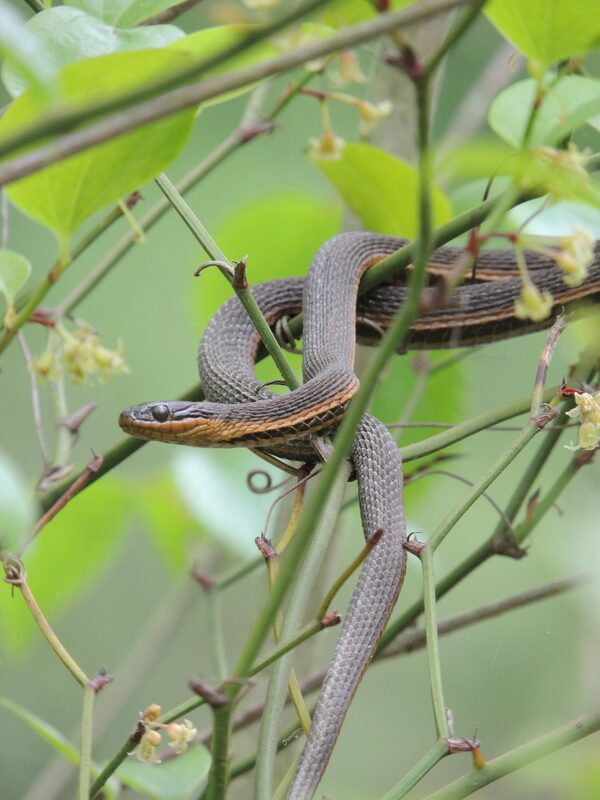 Jim White, author of Reptiles and Amphibians of Delmarva, took this photo of a Queen Snake, sunning in a shrub, on May 21, 2013 near Middletown, DE. 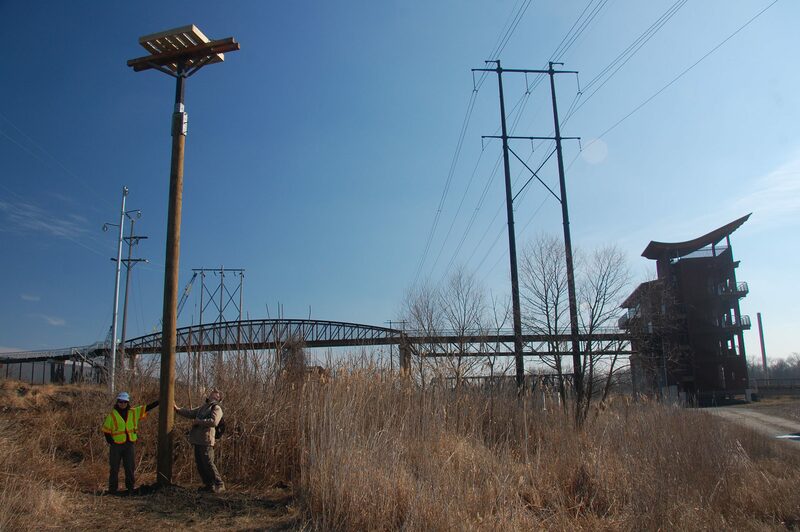 The Russell W. Peterson Urban Wildlife Refuge has a new Osprey nesting platform. DNS worked with Cristina Frank, senior environmental scientist with Pepco Holdings, to install a new platform near the DuPont Environmental Education Center. It can be easily seen at eye level as you cross the bridge to the building. New Osprey nesting platform near the DuPont Environmental Education Center. Photo by John Harrod. This is the second nesting platform in the refuge. 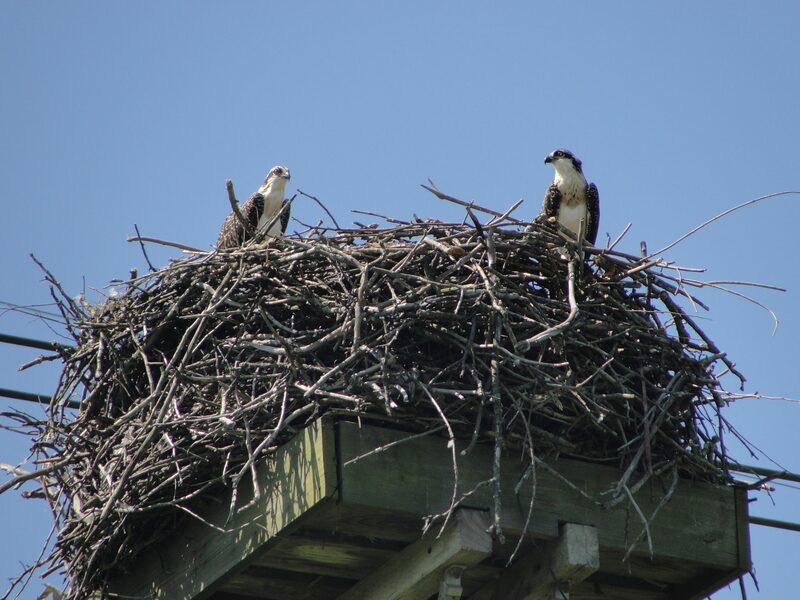 The first, which has had an active Osprey pair for eight years, was originally put up as a new home for the birds after they built a nest on transmission lines. The location of the new platform is far enough away that two pair can reside in the refuge without incident. Original Osprey pair on the first nesting platform. Photo by Jim White. To help encourage a second pair of Osprey to take up residence on the new platform, it is seeded with an armload of branches. Seeding the platform with branches to encourage new Osprey residents. Photo by Jim White. 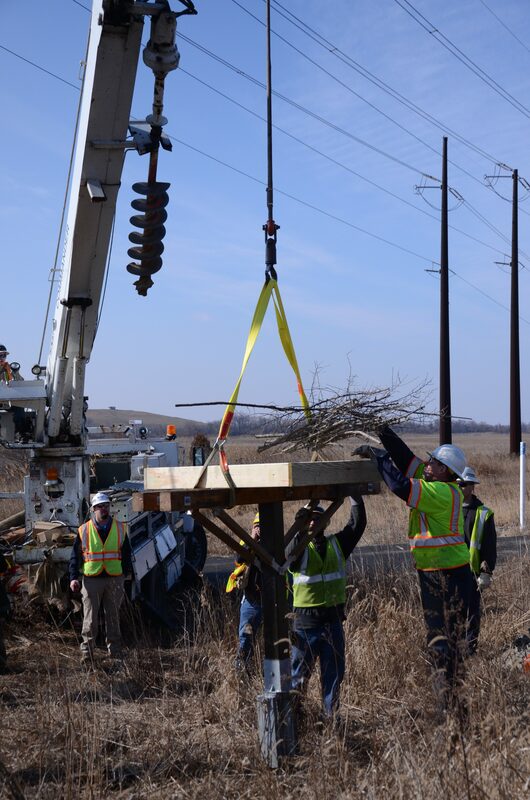 The latest platform was installed as part of a larger project to replace the old, wooden transmission lines passing through the refuge. 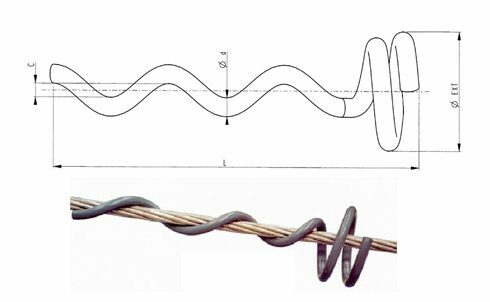 Pepco will be installing line markers, including spiral bird diverters, to increase the visibility of the new power lines and prevent collision. We look forward to welcoming a second pair of Osprey to the refuge. Join us at DEEC on Saturday, April 21, for the DNS Earth Day Festival to meet Cristina Frank, learn how new transmission lines are built to protect birds, and hopefully see our newest residents. 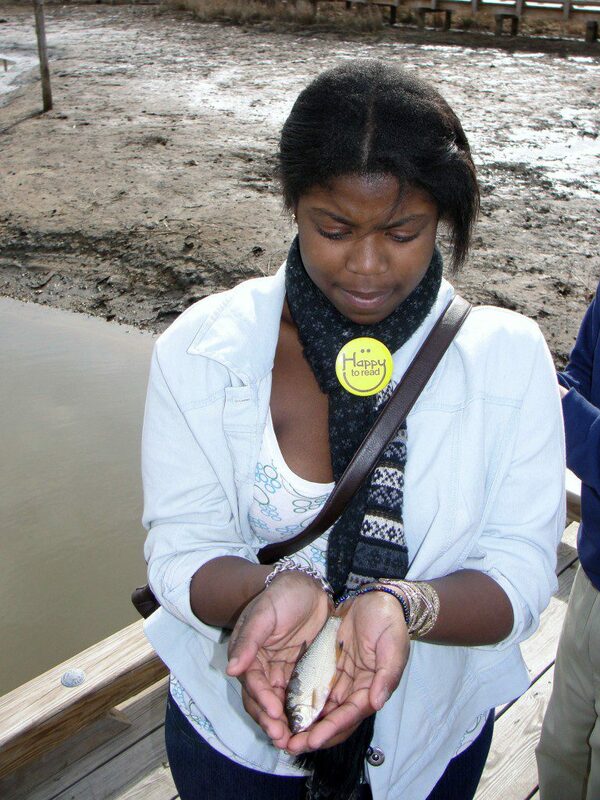 On January 31st 18 students from Crossroads of Delaware came to the DuPont Environmental Education Center (DEEC) to participate in a ‘What’s in the Water?’ field study. We enjoyed mild winter temperatures as we researched the answer to this question. 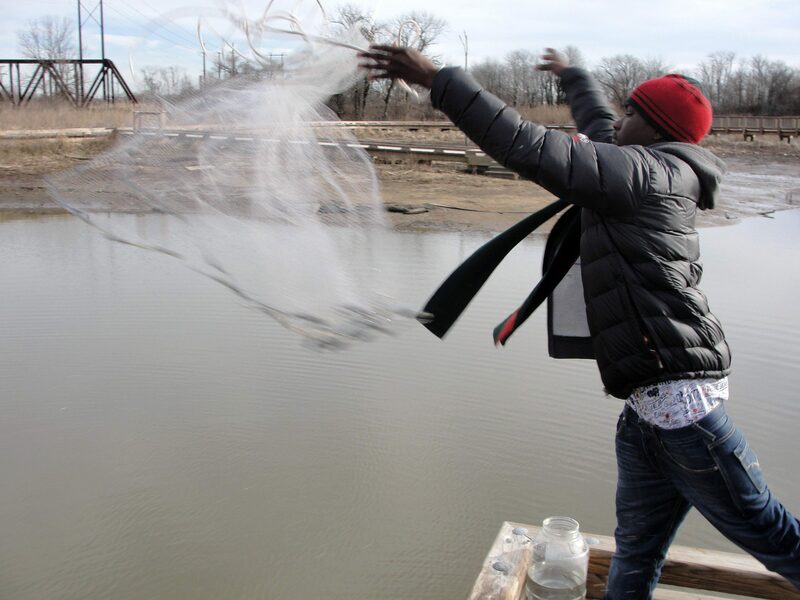 Students used pond nets, a fish trap baited with cat food, a minnow trap baited with bread, and microscopes. 18 species were found in and around the pond within the 90 minute program. Nice job Crossroads! Golden Shiners were caught by students using the fish trap. This minnow species can reach up to 14 inches long and are a top notch bait fish, especially for striped bass seekers. There are plenty of snails, pond plant material, and zooplankton for them to feast on in our pond. The students also caught dozens of small blue gills (1-2 inches long) using pond nets. These young blue gills, mummichogs and killifish serve as feeder fish for larger pond fish as well as wading birds such as the great blue heron, whose tracks were observed along the pond banks. 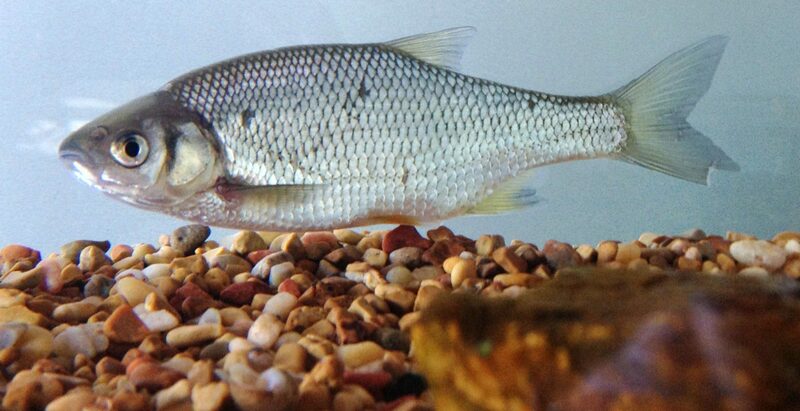 We kept a Golden Shiner, Blue Gill, Killifish, and Mummichog in our native fish tank. Stop by DEEC and check them out! An adult Northern Mockingbird perches in a thicket. Image by Derek Stoner. As I walked over the bridge to the DuPont Environmental Education Center (DEEC) recently, I saw a gray bird with a long tail and flashes of white on its wings. These fieldmarks are the hallmark of our resident Northern Mockingbirds. 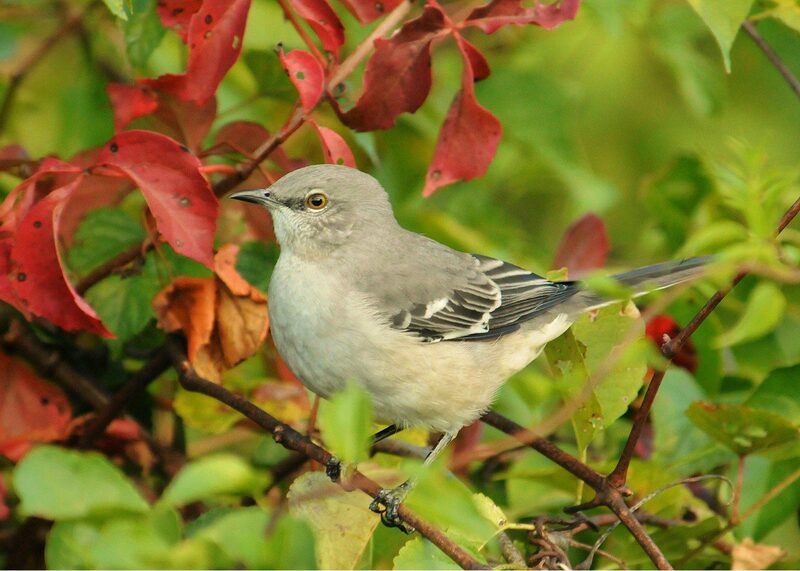 Mockingbirds, often called “Mockers,” can mimic other bird songs and man-made devices like cell phones. They are one of three birds in our area that are mimics, in the bird family known as Mimidae. The other mimics are Brown Thrasher and Gray Catbird. These birds have a series of phrases that are repeated 2-6 times before going on to another song. They often have over 150 distinguishing songs and can actually learn new ones throughout their lifetime. Both male and females sing, but it’s the single male that is usually found continually singing, even into the nighttime. Mockingbirds also make a scratchy “chat” call to warn off intruders or when they are disturbed. 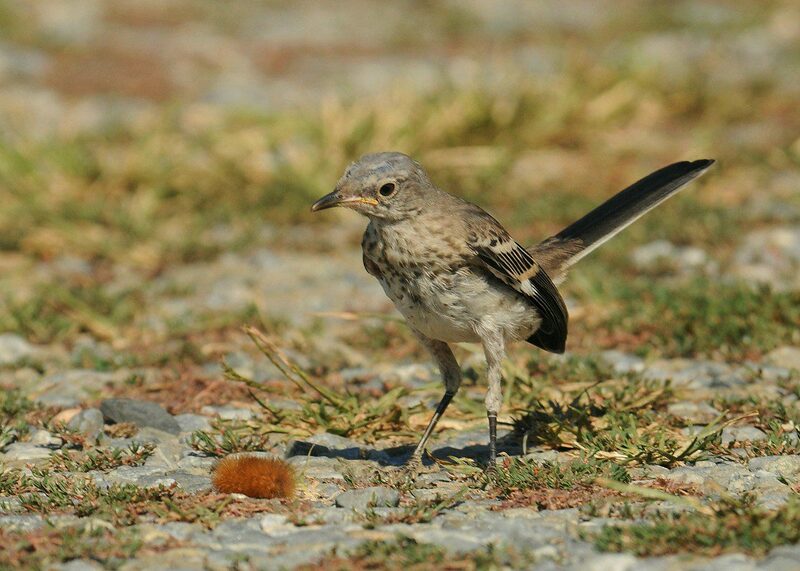 A young Northern Mockingbird investigates a Tiger Moth caterpillar crawling by. Image by Derek Stoner. Mockingbirds are very territorial and have been known to chase animals and even people from their area, especially if they have a nest nearby. They eat a wide variety of fruit and insects. The area under the DEEC bridge is perfect Mockingbird habitat with open areas loaded with insects and native bushes loaded with fruit. 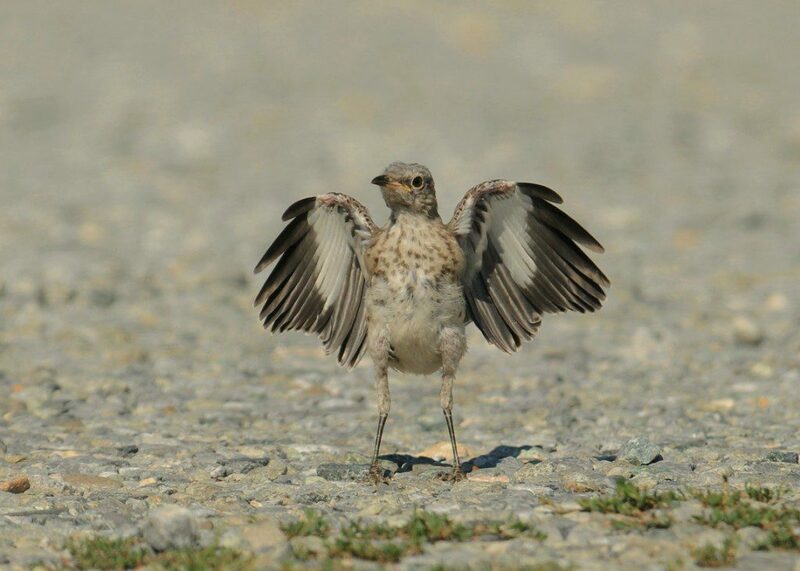 A fledgling Northern Mockingbird stretches its wings. Image by Derek Stoner. Because the female lays 2-6 eggs and can have offspring 2-3 times during the summer, the five Mockingbirds in our area are probably from the same family. As you walk over the bridge at DEEC, take a look and see if you can observe one of our resident Mockers.